Home / Feature / Do doctors spread germs via their coats? For those who work in the medical field, the white knee-length coat is a symbol, not only for their authority as professionals but also for the strict hygiene standards they have to abide by. These garments prevent doctor-patient contamination, offer some storage space for items such as pens and small medical instruments, and also allow easy recognition by colleagues and patients. They also underline doctors’ authority. But ironically, these white coats have recently come under fire for posing an infection risk when worn outside clinical environments. 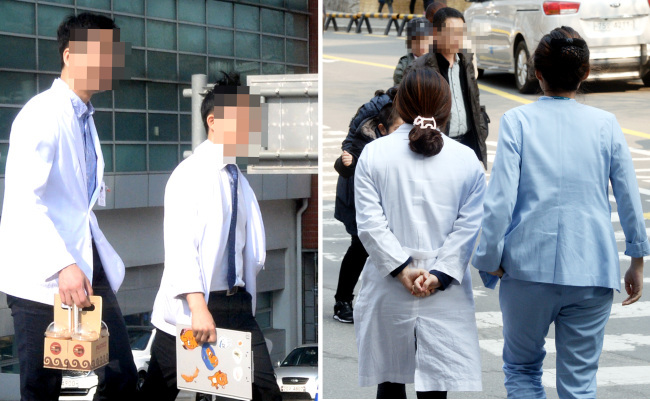 Shin Ji-eun, a part-timer at a cafe next to a hospital in Bundang, Gyeonggi Province, frequently witnesses doctors wearing their white coats out in the streets. “Almost every day, I see doctors and nurses in their medical gowns, on their way out for a quick lunch or coffee,” Shin said. If the intention is to look professional in public, the doctors should find another way to do so — one which would not cause sanitation concerns, she added. Experts, however, claim there is no proven connection between these uniforms and infections. “There is little clinical evidence on the impact that the white coats may have on potential infections,” Park Do-joon, director general of the Korea National Institute of Health, told The Korea Herald. But doctors are nevertheless advised not to wear them outside the hospital, due to the possibility they might play a role in transferring pathogens to the community, he added. Earlier this month, the Ministry of Health and Welfare released a proposal of recommendation for health care workers to “not go outside in their duty uniform (white coat) and pay extra attention to personal hygiene.” It also recommended patients not to leave hospitals wearing their hospital gowns. In Korea, Rep. Shin Kyoung-min of the main opposition Democratic Party of Korea motioned a bill related to the current Medical Service Act in July last year, to ban medical workers from wearing their white coats outside the hospital. “With the series of epidemic outbreaks, our society should become more careful to prevent contamination inside and outside a hospital,” the lawmaker said. But some view these pre-emptive moves as excessive restrictions. “We should not expect doctors to strictly abide by such regulations when there is no concrete evidence that their coat is a source of spreading infection,” Kim Nam-joong, a professor at Seoul National University Hospital’s division of infectious diseases, told The Korea Herald. “What about mobiles phones? They are almost never sterilized,” Kim added. Several years ago, SNU hospital redesigned its duty uniforms for doctors and nurses, changing them to short-sleeved ones and with bow ties, on the premise that long sleeves and ties might increase contact between staff and patients.